You are here: Home / NJ Law / What Are Garden State DUI Limits? It can be a frightening occurrence when a driver is pulled over by law enforcement in New Jersey on suspicion of driving under the influence. If the driver hasn’t been drinking, there should be nothing to fear from an officer going through the procedures of investigating a possible DWI or if the stop takes place at a checkpoint. If, however, the driver has been drinking alcohol and might be in jeopardy of an arrest, it is important to know the legal limits for blood alcohol content (BAC) before an arrest can be made and the accompanying penalties if, indeed, a DWI arrest happens. Before a driver can be tested for DWI, the officer must have a viable reason to make the traffic stop and conduct the field sobriety and breathalyzer tests. If, for example, a driver is weaving on the road the officer sees this, it is sufficient reason to make the traffic stop and investigate for DWI. The officer will speak to the driver, ask for the driver’s license, registration and proof of insurance all the while looking for telltale signs of possible intoxication. These can include glassy eyes, slurred words and the smell of alcohol. If the officer believes that it is necessary, he or she will then ask the driver to submit to field sobriety tests. If there is still a belief that the driver was driving drunk, the officer will then ask the driver to take a breathalyzer test. 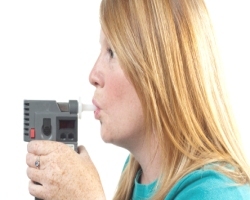 For the breathalyzer, the officer must follow certain procedures such as observing the driver for 20 minutes to make sure nothing is done to compromise the accuracy of the test. This can include chewing gum, regurgitating and smoking a cigarette. Then the test will be given. If a driver over the age of 21 registers a BAC of 0.08%, it is over the legal limit and there will be an arrest for DWI. Drivers under 21 who register 0.01% will be arrested for DWI. For commercial drivers, the BAC is 0.04%. Many believe that if they are under the legal limit of BAC, they will not be arrested for DWI. This is not true. If there is sufficient reason – erratic driving, failing field sobriety tests, slurred speech – an arrest for DWI can still be made even if the BAC is below 0.08%. Higher levels of BAC can result in more severe penalties in the event of a conviction. If a driver has a BAC of 0.10% or above, the penalties will be far worse than if the BAC is between 0.08% and 0.10%. Once a driver has been arrested for DUI or a DWI, the penalties vary depending on how much alcohol was in the blood. A driver who is convicted of having a BAC of between 0.08% and 0.10% will lose driving privileges for three months. There will be a fine of between $250 and $400. The driver will have to pay $230 for the Intoxicated Driver Resource Center (IDRC). $100 each will be paid to the drunk driving fund and the Alcohol Education and Rehabilitation Fund (AERF). $75 will be paid to the Neighborhood Services Fund. There will be a surcharge of $1,000 per year for three years. The driver might also face jail time of up to 30 days. In addition, the driver might have to spend 12 to 48 hours at the IDRC. The penalties grow worse with higher BAC. If the driver registers a BAC of 0.10% or above, the driver’s license will be suspended for seven months to one year. The fine is increased to $300 to $500. The IDRC, AERF, drunk driving fund and Neighborhood Services Fund fines all stay the same as does the surcharge and jail time. The time at the IDRC will be 12 to 48 hours. If the BAC is 0.15% or above, the driver will have an ignition interlock device placed on the vehicle for the duration of the driver’s license suspension and six months to one year after privileges have been restored. If a driver is caught committing a DWI within ten years of the first conviction, the driver’s license will be suspended for two years. The fine will be for $500 to $1,000. The IDRC fee rises to $280. The other financial penalties stay the same. Jail time can be between 48 hours to 90 days. There could be 30 days of community service, 12 to 48 hours at the IDRC and the ignition interlock device for one to three years after driving privileges have been reinstated. In the event that a driver is convicted for a third time within ten years of the second time, the driver’s license will be suspended for ten years. The fine will be for $1,000. All fees stay the same except for the annual surcharge, which rises to $1,500 per year. The jail sentence will be for six months. There can be 90 days of community service, 12 to 48 hours at the IDRC and the ignition interlock device for one to three years after driving privileges have been reinstated.